Italian painter, known as Michelangelo of the Battle because of his predilection for battle scenes. 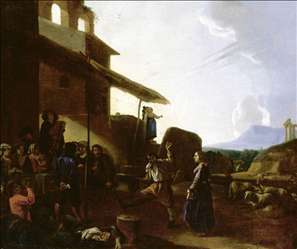 He spent all his career in Rome, but had considerable contact with Northern painters; his friendship with the Dutchman Pieter van Laer led to his becoming the leading Italian exponent of bambocciate (small pictures low-life and peasant scenes). He also painted small religious and mythological works and still-lifes. He was born of Roman parents, baptized in the parish of S Lorenzo in Lucina. A member of the Accademia di S Luca since 1634, Cerquozzi attended meetings of the society as late as 1652. His friends included Domenico Viola, Pietro da Cortona and Giacinto Brandi. More significant were his associations with foreign residents in Rome. According to Baldinucci, Cerquozzi had special affection for the Spanish, owing to the patronage he received from the major-domo of the Spanish Embassy as a youth, and would often don Spanish attire as a sign of his sentiment. His Spanish connections may partly account for the many commissions he later received from patrons identified with Rome s pro-Spanish political faction. Cerquozzi enjoyed equally good rapport with northern European residents of Rome. 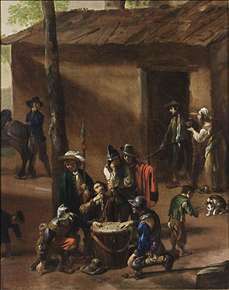 He is documented as having quartered with artists from beyond the Alps, including Paulus Bor and Cornelis Bloemaert, for the bulk of his career. His contacts with Dutch and Flemish painters living in his native city profoundly affected his artistic development. 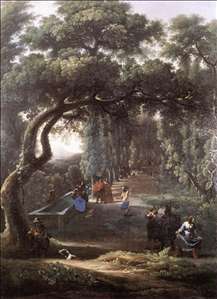 See more details about "Figures in a Tree-lined Avenue"
See more details about "Soldiers Playing Dice"
See more details about "Street Scene in Rome"